Under second-year Head Coach Bum Phillips, the perennially-losing New Orleans Saints were showing signs of improvement. They started off the 1982 NFL season at 1-1 before the whole league went on hiatus for eight weeks due to a players’ strike. Upon returning, the Saints defeated the Chiefs and headed to San Francisco for a matchup with the 49ers on November 28. 36-year-old QB Ken Stabler (pictured at right) had been picked up just before the season began after having been unceremoniously released by the Oilers. 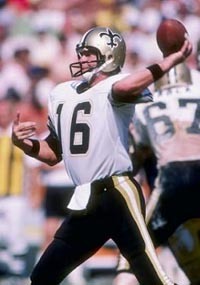 Taking the spot of injured QB Dave Wilson, “The Snake” had beaten out 11th-year veteran QB Archie Manning for the starting job. RB George Rogers was also a key player in the conservative offense that Phillips preferred to utilize. The defense had promising young talent, most notably DE Bruce Clark and LB Rickey Jackson. The 49ers, under Head Coach Bill Walsh, were coming off a championship season in 1981 but had lost their first two pre-strike games in ’82 and, having also won their first post-strike contest, were at 1-2 as they hosted the Saints. While QB Joe Montana, who had emerged as a star in the title year, was still playing at a high level, the running game was insufficient and injuries on defense were a problem. There were 51,611 fans at Candlestick Park on a rainy day in San Francisco. Things didn’t start out in promising fashion for the visitors. On their initial possession, a Stabler pass was deflected and intercepted by LB Willie Harper. While the 49ers weren’t able to capitalize on the turnover, they advanced to the New Orleans 34 and Jim Miller’s punt pinned the Saints down at their own one yard line. However, Ken Stabler completed all five of his passes as the Saints drove 99 yards in the rain for the early lead. “The Snake” started with a 16-yard pass to TE Hoby Brenner from the one yard line, included another pass to Brenner for 25 yards, and finished off the series with a 10-yard scoring throw to FB Wayne Wilson. San Francisco came back in the second quarter with a 57-yard drive in eight plays that ended with Ray Wersching kicking a 40-yard field goal. 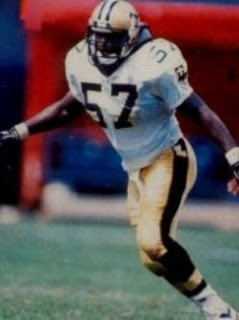 But later in the period, Rickey Jackson (pictured below) recovered a fumble at midfield and New Orleans capitalized as George Rogers ran for a 38-yard gain and RB Jimmy Rogers capped the five-play possession with a two-yard run for a touchdown. While Toni Fritsch’s extra point attempt hit the upright and was unsuccessful, the Saints were ahead by 13-3. Just before the end of the first half, Wersching booted a 45-yard field goal to narrow the margin to 13-6. In the third quarter, New Orleans had first possession and methodically went 54 yards in 11 plays ending with Fritsch kicking a 27-yard field goal. Shortly thereafter, Jackson made another big play on defense as he intercepted a Montana pass and returned it 32 yards to the San Francisco six to set up a second scoring run by George Rogers, this time of just a yard. The extra point was good and the Saints held a seemingly-comfortable 23-6 lead. The New Orleans defense stymied the 49ers until late in the fourth quarter and San Francisco also fumbled the ball away twice, once at the New Orleans 24. But with just over five minutes remaining to play, Montana and the 49ers caught fire. They drove 79 yards in nine plays that featured pass completions of 24 and 12 yards to WR Dwight Clark and 14 yards to WR Freddie Solomon. Following Montana’s completion to FB Earl Cooper for 13 yards to the New Orleans 17 in a second-and-15 situation, HB Jeff Moore ran for five yards and a first down and Montana fired a 12-yard touchdown pass to Moore. After a short series and punt by the Saints, the Niners got the ball back at their 41. A Montana pass to Solomon, who lateraled to Moore, got the ball to the New Orleans 29. It took a total of six plays to get into the end zone with Montana hitting TE Russ Francis from 17 yards out. But the score came with just five seconds remaining and San Francisco’s slim comeback hopes ended on the ensuing onside kick that WR Jeff Groth recovered for the Saints. New Orleans came away with a 23-20 win. The 49ers gained more yards (376 to 324) and had more first downs (21 to 17) than the Saints, but also turned the ball over three times while New Orleans did so just once. San Francisco’s problems running the ball were also a hindrance, with 55 yards on 16 carries. Ken Stabler completed 11 of 20 passes for 154 yards with a touchdown and an interception. 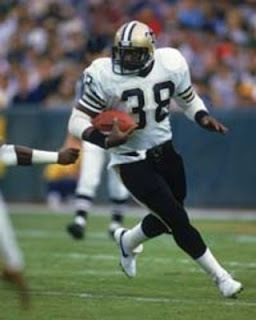 George Rogers (pictured below) rushed for 97 yards and a TD on 17 carries, the biggest chunk of the 170 yards on the ground for New Orleans. Wayne Wilson, who ran for 25 yards in 8 attempts, had 53 receiving yards on his three catches to lead the club, and scored a touchdown. Hoby Brenner also had three receptions, for 49 yards. For the Niners, Joe Montana was successful on 27 of 42 throws for 334 yards and two scores while tossing one interception. Dwight Clark pulled in 6 passes for 90 yards and Earl Cooper also had 6 catches for 68 yards to go along with his 15 yards on five runs. Likewise Jeff Moore, the team’s leading rusher with 23 yards on 8 attempts, gained more yards through the air as he caught four passes for 65 yards and a TD. “A lot of people had written me off, but I don’t ever remember leaving,” said Ken Stabler. It was the high point of the abbreviated season for the Saints, who at 3-1 were off to the best start in franchise history and thinking playoffs. They lost their next four games and ended up with a 4-5 record, placing ninth and just out of the running for a postseason slot in the revised post-strike structure (no divisions with the top eight teams in each conference qualifying for spots in the playoff tournament. The Detroit Lions, also 4-5, came in eighth due to a better conference record than New Orleans). San Francisco had an even more disappointing year in going 3-6 to finish eleventh in the NFC. Ken Stabler didn't have a big statistical season but helped the Saints with his leadership and savvy. He completed 61.9 percent of his passes for 1343 yards with six touchdowns and 10 interceptions. Injuries wore him down, as was also the case with George Rogers, who was nagged by a hamstring injury but rushed for 535 yards in six games and earned a second straight trip to the Pro Bowl.